Austin Dorcey is no stranger to St. Vincent de Paul’s mission to feed. For the last two years, the 15-year-old has been supporting SVdP by fundraising for KNIX’s “Million Can Crusade,” which has made him somewhat of a local celebrity. Austin, the KNIX team, and Barrel Boy (his personal hero) teamed up to encourage listeners to support the cause by donating either food or monetary donations to the drive, in order to help feed hungry families during the holidays through SVdP programs. 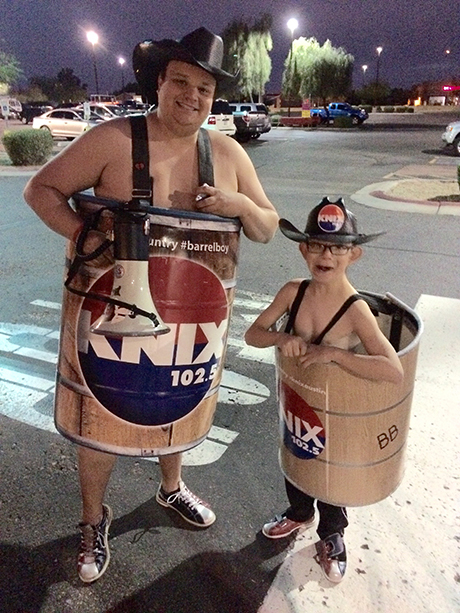 Austin even donned his own barrel costume, taking on the identity of “Barrel Buddy”, to help him raise awareness for the drive. Since 2016, Austin and his family have raised over $2,000 dollars for SVdP and Million Can Crusade. His continued support allows the SVdP team to make a difference in the lives of families year round. It is not only the combination of Austin’s incredible selflessness that makes him such a heroic kid, but it’s also that Austin unconditionally gives even in the face of a life-threatening heart condition. When Austin was born, the doctors who treated him did not expect him to live long. In fact, they told Austin’s parents that every minute he lived would be a blessing to his family. Austin was born with a congenital heart defect, Hypoplastic Left Heart Syndrome (HLHS). This means the left side of his heart is severely underdeveloped and doesn’t function. “The first couple of years of Austin’s life were very tough and he was very sick a lot of the time. He spent most of the time in the hospital,” says his mother, Sarah Dorcey-Garcia. According to Sarah, Austin also has a genetic disorder, cirrhosis of the liver and development and physical disabilities. “We never thought we would get to spend a first birthday with him, let alone the last 15 years. But he doesn’t let any of his medical conditions stop him or get him down. He is the happiest and most loving person we know,” she says. Austin’s incredible spirit hasn’t gone unnoticed. His positivity and generosity were brought to the attention Colten Cowell Foundation. This local organization creates unforgettable experiences for families impacted by significant life challenges by inviting the child, their family, and friends to experience “The Bat Cave”. 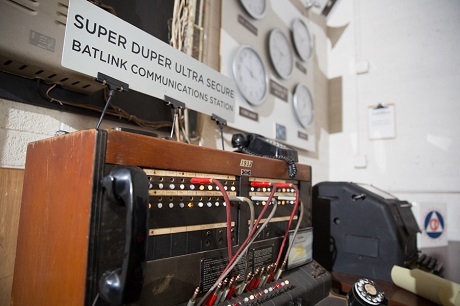 Yes, Bruce Wayne’s Bat Cave—as in the superhero Batman! 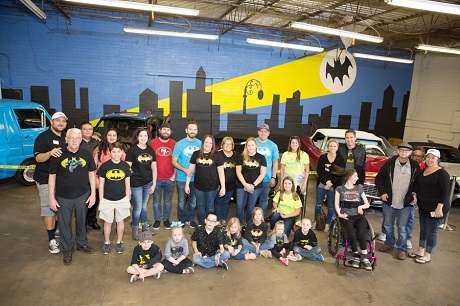 Together with HopeKids, another organization that provides events and experiences for children with life-threatening medical conditions, Austin was nominated to visit Wayne Industries and the Bat Cave. 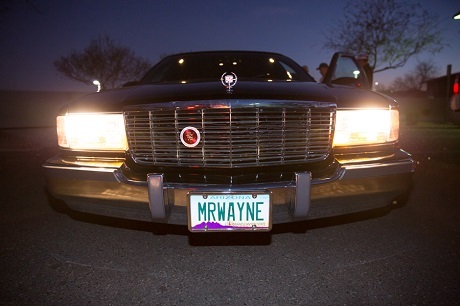 The night began with a limo ride to Wayne Industries. Upon arrival, Austin was greeted with loud cheers from family, friends, and SVdP employees (Austin kindly extended the invite to us). The group was escorted inside to a secret entrance where Austin put his strength to test, and descended down a pole into the Bat Cave. Below waiting to be explored, was a room full of blinking lights, electronic gadgets and gizmos, dazzling vintage cars—including the Batmobile, and surprises around every corner. While marveling at Batman’s collection of crime fighting tools, the unthinkable happened. The Bat Signal appeared on the wall! Bruce Wayne was needed, but he was nowhere to be found. Luckily, Mr. Wayne’s backup protocols told his team that Austin was needed to fill his place. 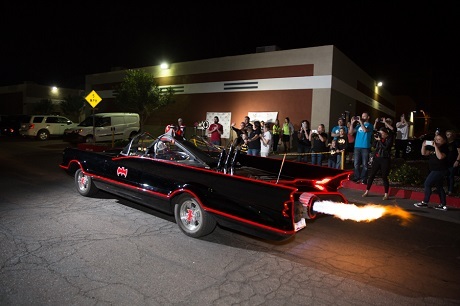 After safety checks and a mission briefing, the Batmobile and Austin shot out of the cave to drive around the block on a crime fighting mission. Before the night was over, Austin had a special announcement for his friends at SVdP. 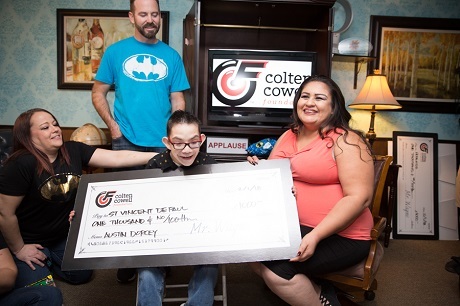 The Colten Cowell Foundation believes that, “being a Super Hero isn’t just about the fast cars and cool gadgets—it’s also about helping those in need.” It’s important for honorees to learn about the importance of giving and to experience firsthand how rewarding it can be. Suddenly, it became clear why Austin invited SVdP. He had a special surprise for us! Austin presented SVdP with a $1,000 check—a donation in his honor. “I love St. Vincent de Paul!” he exclaimed. Even on Austin's special night, he made time to give back. In movies or television, heroes are often portrayed as crime fighters, with super strength and colorful costumes. But, is that what it means to be heroic? Merriam-Webster defines hero as, “one who shows great courage”. Those words in so many ways remind us of SVdP supporters like Austin and his family, who continue to give selflessly in spite of life’s hardships. We thank Austin being SVdP's very own super hero, and for the friendly reminder that not all heroes wear capes. Endowment funds are critical to the long-term health and stability of nonprofit organizations like St. Vincent de Paul. They can be given toward general funds or designated for a specific program. They enable us to level out our funding sources over good times and bad. Your gift of any amount, whether $50, or $50,000, will insure that SVdP is here today, tomorrow, next year and forever.